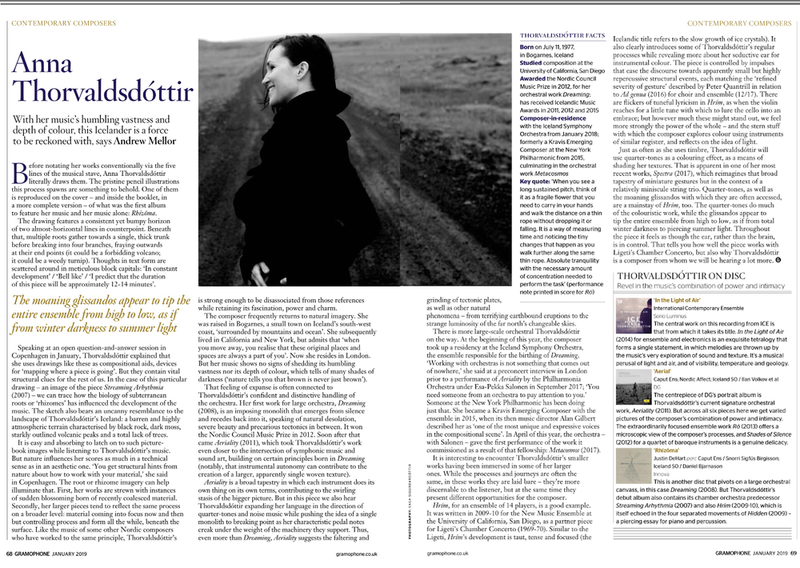 Anna Thorvaldsdottir’s music is composed as much by sounds and nuances as by harmonies and lyrical material. It is written as an ecosystem of sounds and materials that are carried from one performer - or performers - to the next throughout the progress of a work. All materials continuously grow in and out of each other - as a performer plays a phrase, harmony, texture or lyrical line, it is being delivered to another performer as it transforms and develops, passed on to be carried through until it is passed on again to yet another. Anna’s music is often inspired in an important way by nature and its many qualities, and the qualities she tends to be inspired by are often structural, like proportion and flow, as well as relationships of balance between details within a larger structure, and how to move in perspective between the two - the details and the unity of the whole. Anna’s music is frequently performed internationally, and has been featured at several major venues and music festivals such as Lincoln Center's Mostly Mozart Festival in NYC, the Composer Portraits Series at NYC's Miller Theatre, the Leading International Composers series at the Phillips Collection in Washington DC, Big Ears Festival, Spitalfields Music Festival, ISCM World Music Days, Nordic Music Days, Ultima Festival, Lucerne Summer Festival, Beijing Modern Music Festival, Reykjavik Arts Festival, Tectonics, and the Kennedy Center in Washington DC. Her works have been nominated and awarded on many occasions - most notably, Anna is the recipient of the prestigious Nordic Council Music Prize 2012 for her work Dreaming, the New York Philharmonic's Kravis Emerging Composer Award in 2015, and Lincoln Center’s 2018 Emerging Artist Award and 2018 Martin E. Segal Award. Some of the orchestras and ensembles that have performed Anna's work include International Contemporary Ensemble (ICE), New York Philharmonic, Berlin Philharmonic, Los Angeles Philharmonic, BBC Symphony Orchestra, London's Philharmonia Orchestra, San Francisco Symphony, Iceland Symphony Orchestra, Ensemble Intercontemporain, NDR Elbphilharmonie, Bang on a Can All-Stars, Yarn/Wire, The Crossing, the Bavarian Radio Choir, Münchener Kammerorchester, Los Angeles Percussion Quartet, Avanti Chamber Ensemble, Royal Stockholm Philharmonic, Vienna Radio Symphony Orchestra, BBC Scottish Symphony Orchestra, Helsinki Philharmonic, CAPUT Ensemble, Oslo Philharmonic, and Either/Or Ensemble. In April 2018, Esa-Pekka Salonen lead the New York Philharmonic in the premiere of Anna’s work Metacosmos, which was commissioned by the orchestra, and the work received its European premiere with the Berlin Philharmonic in January 2019, conducted by Alan Gilbert. Metacosmos will receive its UK premiere at the BBC Proms 2019. Anna is currently Composer-in-Residence with the Iceland Symphony Orchestra. In spring 2019, she is also Composer-in-Residence at the Royal Academy of Music in London. Anna’s debut portrait album - Rhízōma - was released in October 2011 through Innova Recordings and was very well received and appeared on a number of “Best of 2011” lists, e.g. at TimeOut New York and TimeOut Chicago. Anna's portrait album - Aerial - was released by Deutsche Grammophon in November 2014 and appeared on a number of year end lists, e.g. at The New Yorker , Boston Globe, iTunes Classical, and WQXR's Q2. AEQUA was released in November 2018 on Sono Luminus, performed by the International Contemporary Ensemble, with two pieces conducted by Steven Schick and a solo piano work performed by Cory Smythe. The album was on a number of year end lists, e.g. at the NY Times, The New Yorker, NPR Classical, and SPIN Magazine.